Pope Francis met with the head of a breakaway group of traditionalist Catholics amid new hopes for progress toward ending a quarter-century of schism. The Society of St. Pius X said the 40-minute meeting Friday was cordial, and took place at Francis' hotel-residence because the pope wanted a "private and informal meeting" with its superior, Bishop Bernard Fellay, rather than a formal audience. In a statement Monday, the society said its legal status in the church wasn't discussed but that lower-level talks would continue "without haste." The Vatican in 2014 resumed reconciliation talks with the Swiss-based society after doctrinal discussions launched under Emeritus Pope Benedict XVI collapsed. Last year, Francis made an extraordinary gesture by allowing priests of the society, which has no legal status in the church, to hear confessions during his Holy Year of Mercy. The late Archbishop Marcel Lefebvre founded the society in 1969, opposed to the Second Vatican Council's modernizing reforms, introduction of Mass in the vernacular and outreach to Jews and other Christians. In 1988, the Vatican excommunicated Lefebvre, and four other bishops after Lefebvre consecrated them without papal consent. Benedict had made reconciling a priority, liberalizing the use of the old Latin Mass which the society celebrates, removing the excommunications and enduring heated criticism when one of the rehabilitated bishops was shown to have denied the Holocaust. But three years of doctrinal talks collapsed in 2012 after Fellay refused to accept a core set of doctrinal demands required by the Holy See over the society's acceptance of Vatican II. Francis' election initially signaled continued impasse, as the Jesuit pope made clear he cared little for the old Latin Mass, considered traditionalists self-absorbed retrogrades, and was more concerned about spreading the merciful message of the Gospel to society's poor outcasts than resolving thorny theological and canonical disputes. Paradoxically, Francis emphasis on mercy and inclusion, his concern for "peripheral" Catholics and disdain for rigid rules may have allowed for progress. In recent comments, Fellay has signaled new optimism that the group's legal status might be resolved. 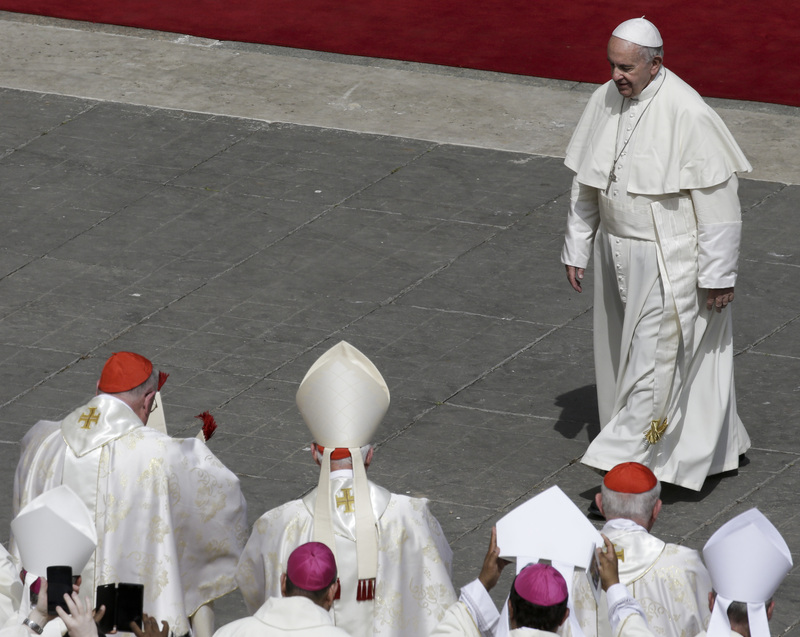 He said Francis had sent bishops to visit the society's seminaries and headquarters to "see us as we are," and that what had been theological stumbling blocks in the past were now up for discussion. "Are we really moving forward? I think so. I think so, but it is certainly slow going," Fellay was quoted as saying in a March 4 interview with the society's Dici.org site. The society says it has 590 priests and 187 seminarians in six seminaries around the world, as well as some 600,000 people who attend Mass regularly. It sounds like this society took a big step backward when what we need to do is move forward.